The first boats he built were a series of prams on the third floor of Quarters "E" in Cloyne Court, Newport Naval Base in the early 1950's. At some point, he became a fan of the Chesapeake Bay "Sharpies". In 1957, his version became the first Rooster, which he named "Kathleen". He copyrighted the plans and designed and built many boats. He also sold many sets of his plans for others to build themselves. The sails always came from Thurston Sails in Warren, Rhode Island, which is still in business and still makes Rooster sails to order, only now they are located in Bristol, Rhode Island. The Rooster is 9 feet, 6 inches long, and weighs about 100 pounds. It’s a lateen-rigged wooden sailboat that can also do double-duty as a rowboat. It is made out of quarter-inch plywood, and has an 8-foot mast with a bamboo sprit and boom, and a daggerboard. There is a seat amidships and one forward, but they are for rowing; sailing is done from the floorboards. The Rooster will accommodate one to three sailors (up to two adults or one adult and two children). It is a stable boat, carrying only 37 square feet of sail. The Rooster, named for the shape of its rudder (the Rhode Island Red Rooster is also the state bird of Rhode Island), was designed to be transported in the back of a 1953 station wagon. It can also ride comfortably on the top of a car or in a truck bed. 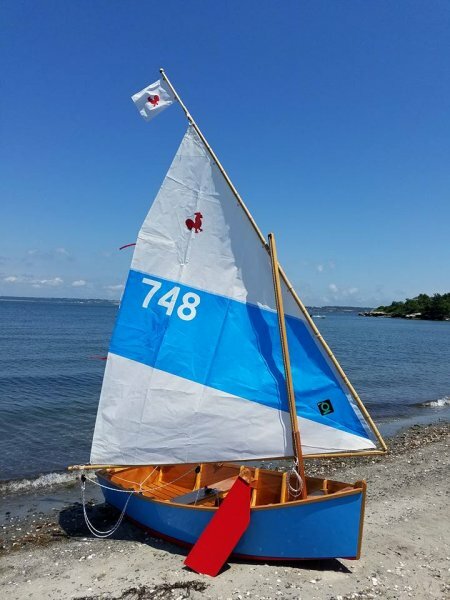 We hope you will enjoy building and sailing your Rooster sailboat and welcome you to the wonderful tradition of wooden boat-building. In order to maintain the lineage of the Rooster class sailboats, we ask that all requests for plans be made through one of the family members and Rooster builders listed below. We have tried to keep our records as complete as possible, so that we may have an idea of how many Roosters and plans for Roosters are out there, and ask that any plans not be copied or given away.